Retail $10.29 SAVE 28% ! These engines are totally dependable. Never had a bad one yet. For a 18 tall rocket with a 1.3 diameter this engine will get it off the ground ok with a quick recovery ejection. Great for small launch areas or windy conditions. For small rockets with streamers this ening will really get it way up there but not so far you&apos;ll lose it. I always use these great engines every trip out. 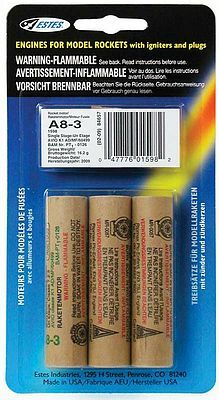 A-class model rocket engine 3 pack. This is a good motor for small rockets in small fields, such as parks. I&apos;ve never had an issue with reliability and the included igniter plugs make for reliable ignition.